The first time I saw ostriches in the wild was in Tanzania a few years ago. I am not sure if the ostriches there were shy or bold when they saw approaching people or cars, and as far as I can recall they weren’t all that shy. The ostriches of the Kalahari were definitely not shy. We see a lot of ostriches in Etosha, just like some of their other desert-adapted avian and mammalian friends. However, I’m yet to see an ostrich that doesn’t run away as soon as it sees a human or a car approaching. They have phenomenal eyesight and when I’m out walking in the veld trying to collect soil and grass samples, they are the first animals to run away. Sometimes they are a tiny speck even when seeing through binoculars when they start their flee. I’m not sure why the ostriches here are so wary of humans. One plausible explanation could be that they were (or are?) often hunted here by our kind. Remember that these are birds that can kick lions to their deaths, and are happy to forage alongside huge herds of springbok, gemsbok and wildebeest. So, if they didn’t think we are danger then they wouldn’t run. Anyway, the typical Etosha ostrich I see is one that’s running away. A picture of a running ostrich’s back isn’t all that interesting — at least to me – and I had been waiting for a time to see them run parallel to the road. Last week was that lucky day I had been waiting for. I first saw two ostriches dust-bathing just after sunset and stopped to see if I can get a nice photograph of the pair. However, the male ran as soon as I stopped my car but the female was more desperate to continue her bath. I thought that the female would run toward the male as soon as she was done, and I was right! 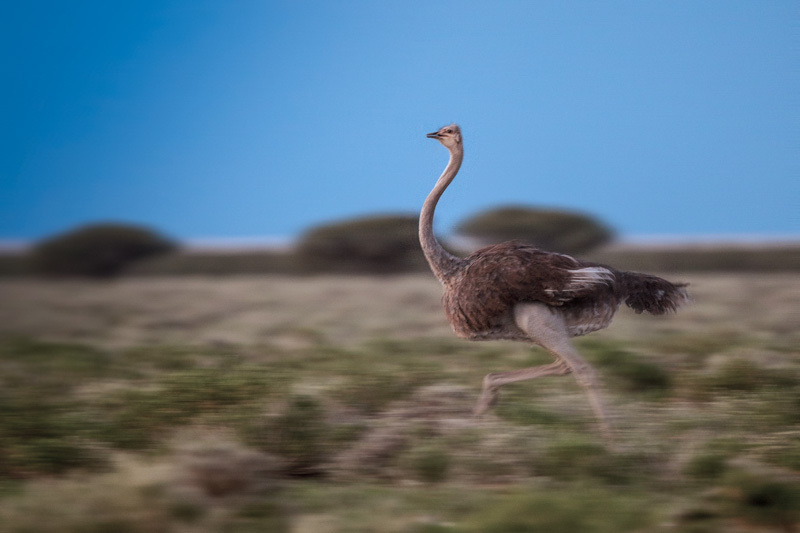 In the soft light of an Etosha dusk, I had a nice photograph of the fastest avian sprinter! Exciting.